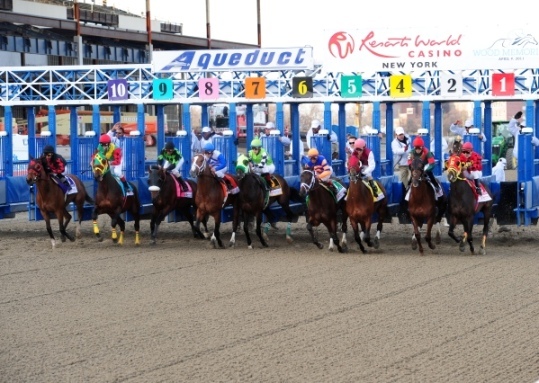 In October 2011, Resorts World New York City Casino (Resorts) opened adjacent to Aqueduct Racetrack. According to NYRA’s Franchise Agreement (Agreement), a percentage of Resorts’ Video Lottery Terminal (VLT) revenue is directed to NYRA for enhanced purses, operational support, and capital expenditures. The Agreement directs that NYRA receive VLT funding until 2033 unless the franchise is terminated before that time. However, the FOB stressed the need for NYRA to develop a plan to become profitable without reliance on VLT subsidies. Translation: VLT subsidies make NYRA – which in addition to Aqueduct, includes more prestigious Saratoga and Belmont – profitable. Without them, Thoroughbred racing in NY is failing. (Cheap Finger Lakes also stays in the black through racino cash; all seven harness tracks, too. In fact, I hold that sans racinos, those eight would have been shuttered by now.) Failing – at a clip of about $22 million/year. End the corporate welfare, NY. And if Horseracing can no longer subsist on its product alone – and it clearly cannot – let it go the way of myriad other American industries that time passed by. As a further incentive, the Empire State will no longer be in the business of sanctioning equine cruelty/killing. Imagine that. When are governments going to stop spoon-feeding this despicable cruelty circus, and death camp? The figures in this report are astounding! These millions would be better spent on crucial things such as infrastructure, healthcare, and education in the state of New York. Instead, these millions are going to support an antiquated, and failing business model that is based on the exploitation of a voiceless sentiment being resulting in death either on the racetrack or in the slaughterhouse. These casinos and government are supporting a cruelty circus, and death camp. It’s got to stop and stop now. For example, Ontario Canada has got to be the most outrageous example of taxpayers money being wasted. For 12 years the horse racing industry received 345 million per year from casino revenues. This was a back room, all boys club deal struck by then Premier Harris – very good buddy of Frank Stronach. It took a change of government hands to perform an audit. Lots of the 345 million per year were unaccounted for. An investigation, and inquiry quickly ensued. It was announced that the government was ending the gravy train to the horse racing industry in Ontario. It was also announced that Ontario horse racing couldn’t survive without handouts. I guess the 345 million per year for 12 years was not enough for them to figure out how to turn their business around. They were too busy spending the money. Enter their savior Premier Wynne who allegedly received millions in election donations from pro-horse racing people during her election campaign. She paid the piper dearly and reversed the previous decision to stop all funding by reinstating funding to the horse racing industry, compliments of the Ontario taxpayer, to the tune of 100 million per year! Not only did she do an about turn, but she EXTENDED the funding from 5 years to 8 years to ensure that it will continue even if she’s elected out of office! Her press conferences to relay this information was held during the day in remote locations, and were announced at the last minute so that people didn’t even have a chance to question her decision. Then the bombshell. She was, evidently, instrumental in BLOCKING the ongoing investigation into where the 345 million per year went since it was unaccounted for. Wow, she’s got to be one of the most corrupt politicians that our province ever elected in. I can’t wait until she’s voted out. I sincerely hope that any new politician who can’t be bought will reverse her decision and finally end all financing to this money sucking money pit they call Ontario Horse Racing. 100 million per year would virtually cancel the debt. If the 345 million per year for 12 years went to Ontario projects for Ontario residents we would have no issues. Shame on her. Shame on all government either in the U.S. or Canada who continues to financially support this cruelty circus, and death camp at the expense of many others who have nothing to do with it. Neither taxpayers or casino money should go to support this despicable industry. Decoupling is the quickest route to end this industry. But mark my words…horsemen are fighting hard. I think the best way is to contact your legislature’s and inform them of your support to decouple. Most politicians have no idea of the cruelty of racing, educate them if you can. Most citizen’s do not know the scope of money hand-outs this industry receives. Enlist the help from horseracingwrongs, to help power your message. Patrick’s work is cold hard facts, facts that need to be distributed into the right hands. I would like to say that the cruelty and death this industry inflicts upon it’s horses, would be enough to end it. But until people are informed and educated that will not happen. And remember where your vote needs to be, for those who support to decouple. Agreed 20+ Insider – Decoupling is the key to ending this endless money trough to this despicable industry. Second, the government needs to CANCEL the Interstate Horse Racing Act. This act was supposed to be temporary to, yet again, bail out this sinking industry. It provides unprecedented lax rules and lack of oversight on the transfer of billions of dollars across state lines for wagering. Third, educate which this blog, thanks to Patrick and participants, is doing very well at it. Four, write your local governments. Make your opinion count. They need to be educated as well. I also agree that the horse racing industry fights back hard. They always seem to bail themselves out via governments. They are probably donating to the coffers of these elected officials because I can’t see how a government can virtually ignore critical issues of their residents to placate this cruelty circus, and death camp. 100% agreed. Who in the hell do they think they are? They obviously think that taxpayers should be their private ATM machines by giving them billions in wagering money! Oh, and by the way, we don’t want any oversight from the government – just give us the money so that we can continue to abuse horses and have them die on our tracks. Come on people – we must stop this insanity. Is there a change of view emerging from Wayne Pacelle, chief executive of the USA Humane Society?